One of my favourite spots to sit and contemplate the World is at the kitchen table looking South. The view is by no means unencumbered. 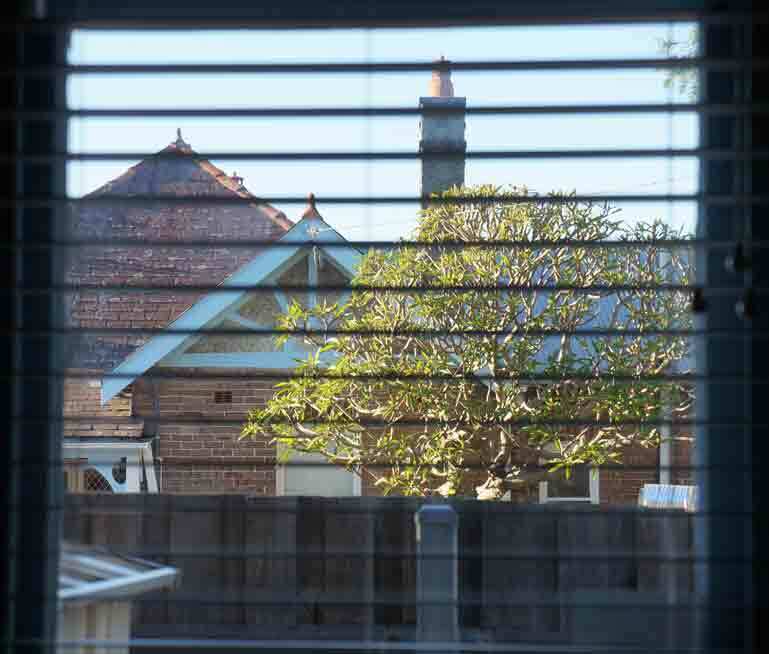 The lower half of the sash window is at the perfect level to gaze over the boundary fence toward a federation house. While I find the style of house aesthetically pleasing, it is typical for the suburb. In the warmer weather the occupants enjoy a smoke on the front porch. The height of the weathered timber, boundary fence has its benefits; I can’t see passersby or vehicles using the relatively quiet street. A clue to the time of the year takes the form of the bloated trunk and branches of a frangipani tree standing within the boundary of the house across the road. For a couple of months it had stood bare, a skeleton of its potential glory. The Spring Equinox was on the 23rd September, since then the tree’s small, shiny, elongated buds have been replaced by a scattering of vibrant, olive green, surfboard shaped leaves. By looking up slightly I can see the sky above the house. An electricity carrying cable sheathed in a yellow and black, diagonal striped cover is the only obstruction to a clear view of the sky. It reminds me that although Australia is considered a developed country, underground power cables are mostly a thing of tomorrow. Where do you like to sit? What can you see?